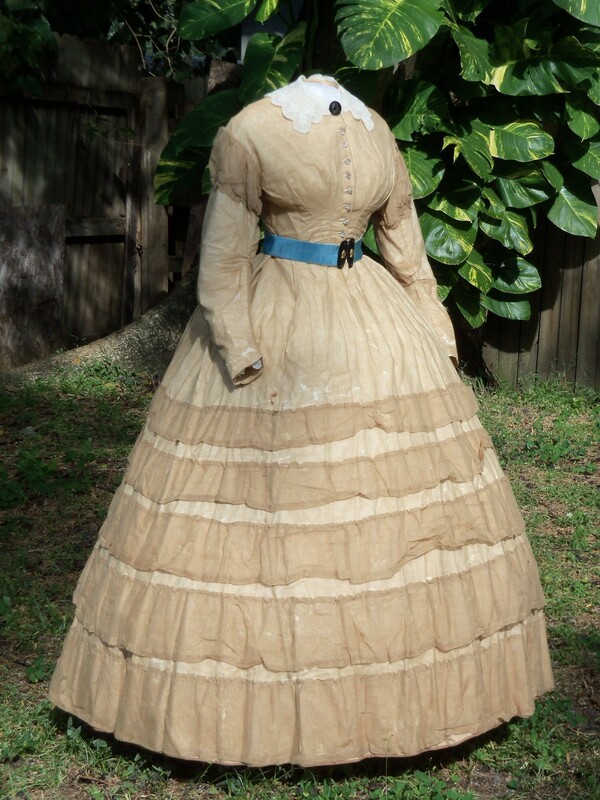 This auction is for a fantastic original lady's walking dress from the 1860s. 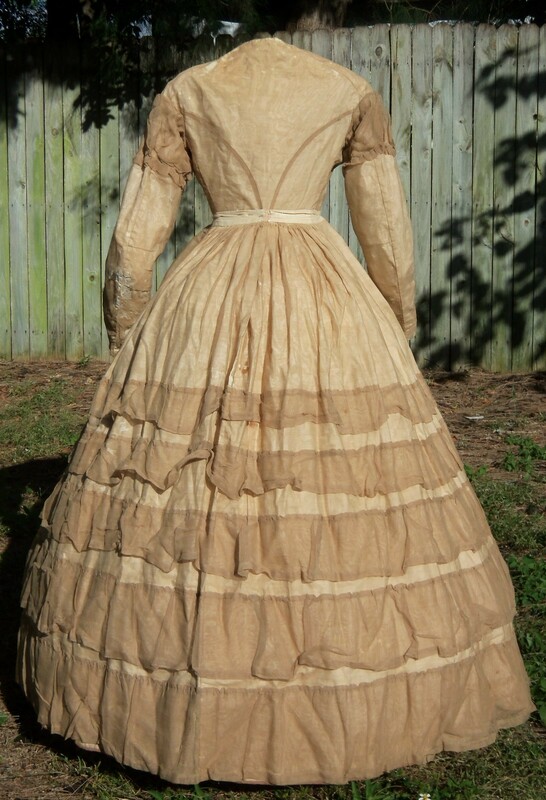 From the latter year or so of the Civil War, its fabric is a fascinating open weave, possibly a silk and wool blend. The dress is trimmed with 5 bias bands slightly gathered. The sleeves are trimmed with a self fabric puff at the top. The neckline and armholes are piped. White muslin lines the dress entirely. The hem is finished with beige wool hem tape. The bodice closes with 8 clear glass buttons. 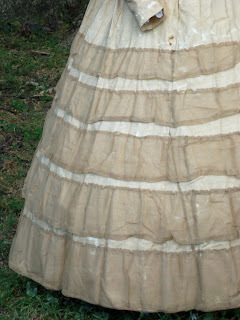 It's skirt has an elegant sweep with small pleats on the hips and cartridge pleats on the back breadths. It closes somewhat unusually for Day Dress, at center back. A pocket rests in the right side seam. Condition is structurally good. It is strong enough to be displayed. There is obvious damage to the sheer fabric. It doesn't distract terribly when viewed from a short distance. 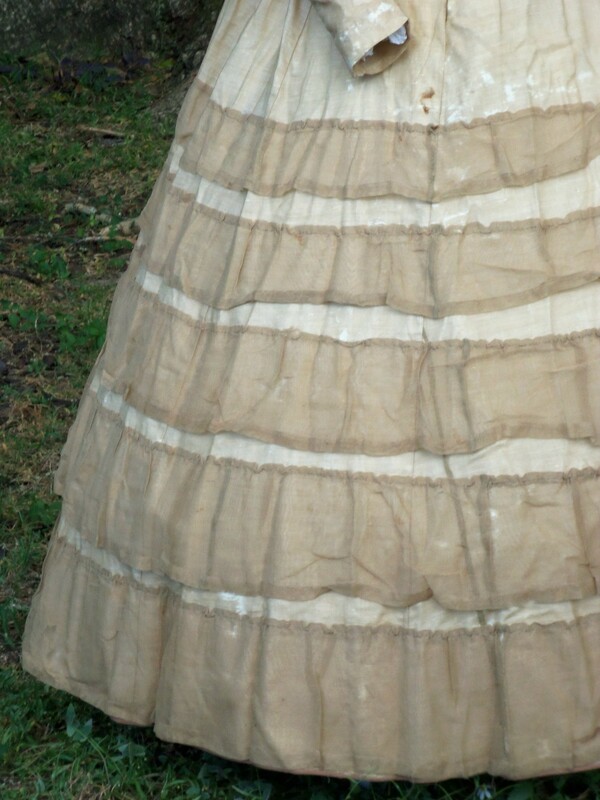 The presence of wool in the fabric is indicated, as it appears to be insect damage. The good news is that, though fragile, the fabric is stable. It is not shattering. Again, the damage doesn't distract significantly from a short distance or compromise the dress structurally. The top button is missing, but this is easily concealed with a brooch. 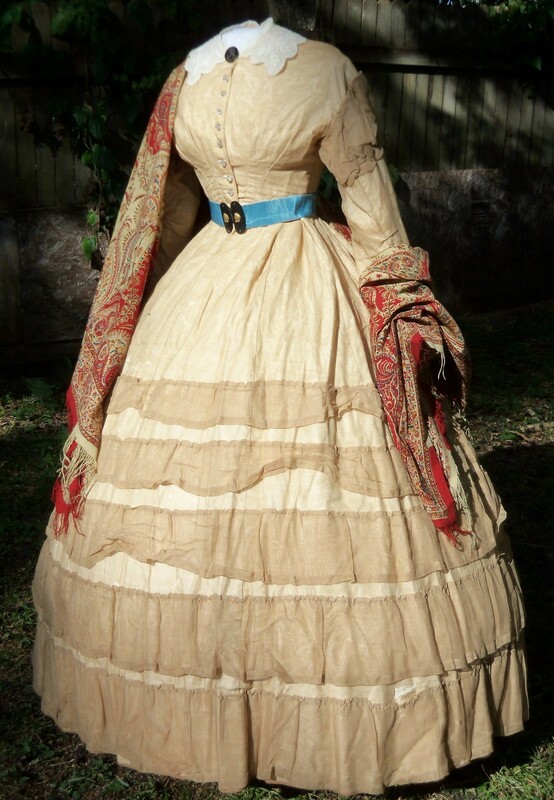 I have shown the dress displayed with several original accessories to visually underline its great display potential. None are included in this auction, but the beautiful roller-printed shawl is offered separately. 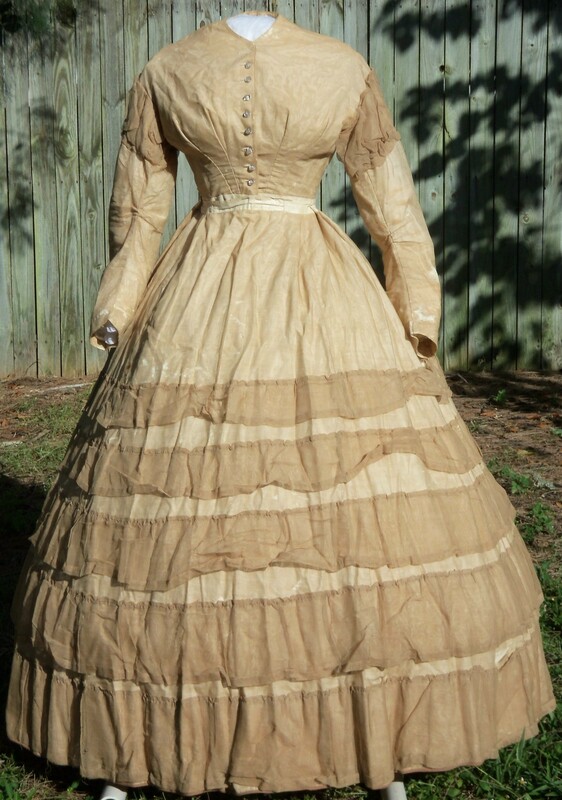 There have been no conservation techniques applied to this dress. Measurements are: The bust is 33 inches & the waist measure 24 inches. The skirt waist is a little larger, about 26.5 inches because of a period enlargement. Wow, that is pretty. I agree, 1865, or 1864 only if the owner was a very fashion-forward lady in the North. I love the puffings; typical sleeve placement for a sheer. What is unusual is the back-fastening skirt. (It's definitely on properly, too.) Perhaps the lady did it just because it was easier, and she didn't need a seam in a particular place for a pocket. 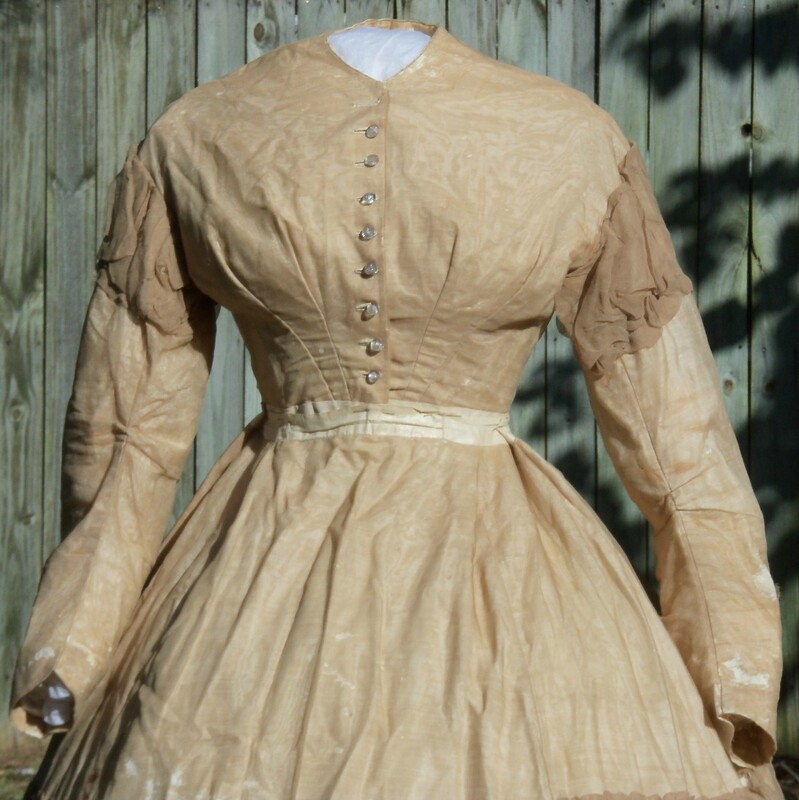 The "period enlargement," though, might mean the back fastening is a later change. 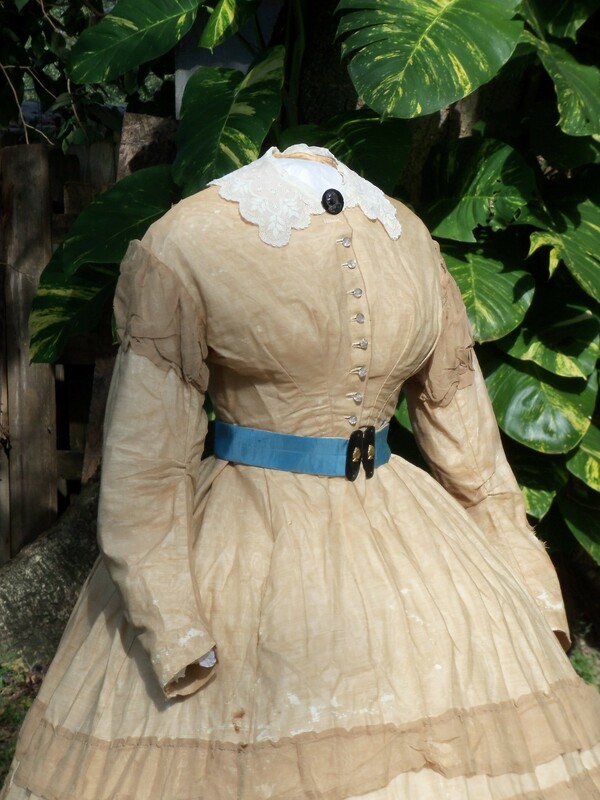 Maybe the skirt was worn separately with a different bodice. 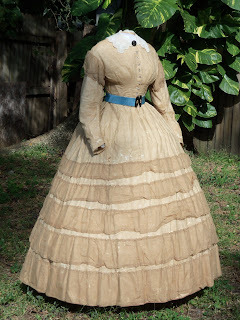 The skirt could be older and a new bodice was fashioned at the end of the war to go with the older skirt.